To make the vinaigrette: Place the cilantro, ginger, honey, lime zest and juice, and Maggi sauce into a large mason jar and shake vigorously to emulsify. Alternatively, place all of the ingredients in a bowl and whisk to emulsify. 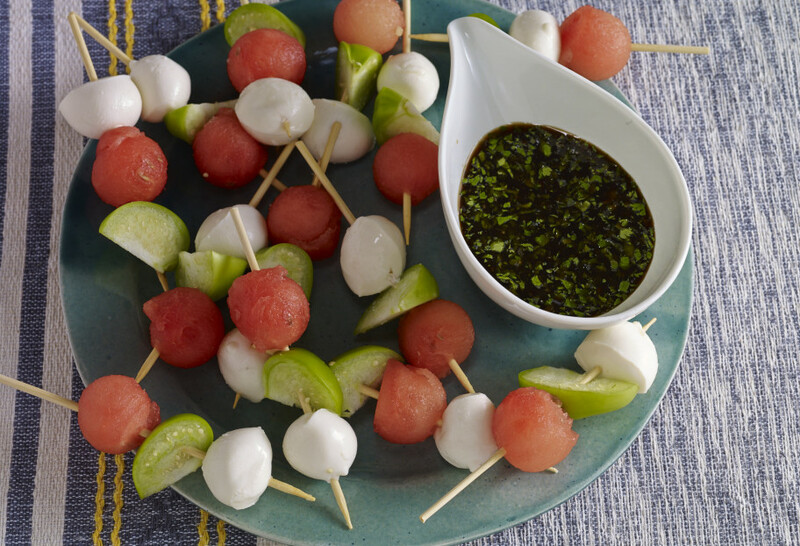 To make the skewers: Slide the watermelon cubes, tomatillo slices and mozzarella balls onto wooden toothpicks or small plastic skewers, alternating between each ingredient. Serve with the lime-honey vinaigrette as a dipping sauce. Hi Annette, Maggi sauce is a seasoning sauce that tastes like a combination of soy sauce and beef bouillon (but made from vegetable extract). It’s Swiss in origin but is very popular in Mexican kitchens! You can find it in the international aisles of supermarkets and Latin groceries, or you can always substitute soy sauce for Maggi sauce.